Some economists get the reputation of always being negative (or positive). I myself have been struggling with that imagine, but have been trying to get rid of it – If you are constantly bearish on the world you will often be wrong. However, ultra-bearishness can be a good “media strategy”. Somebody who is known as an über-bear Nouriel Roubini aka Dr. Doom. Given Nouriel’s repurtation as a ultra-bear there is a tendency among market participants, commentators and even policy makers to pay particular attention to Nouriel’s views when things turn bad. Just take a look at this graph of Google searches for ‘Nouriel Roubini’. It is very clear that during the on-set of the crisis in 2008 Google searches for Nouriel’s name spiked. Since then Googles search for ‘Nouriel Roubini’ has been declining, but we have seen a couple of smaller spikes – particularly during the escalation of the euro crisis in 2011-12. Hence, there is an indication that Roubini-seaches is a fairly good realtime indicator of market distress and general economic worries. Using this indicator should make us optimistic about the world. Did the Evans rule kill Nouriel Roubini? Over the past year we have seen quite a bit of turmoil in global Emerging Markets and lately also a significant increase in geopolitical tensions. Under normal circumstances we should think that this would cause a sharp rise in risk aversion. However, that has not happened and the Roubini-search indicator is a good illustration of that. In fact it looks like the Federal Reserve’s de facto announcement of the Evans rule in September 2012 has had a significant lowered market volatility and risk aversion in general – visible in the continued and persistent decline in the number of Google searches for ‘Nouriel Roubini’ since September 2012. In my view the Fed has effectively succeed in bringing back a monetary policy regime with what Bob Hetzel has termed ‘Lean-Against-the-Wind with credibility’. Despite all it’s (many!) faults the Fed has likely succeed in ending the Great Recession and we are effectively moving back to a pre-crisis style of world – New Great Moderation. That is great news for the global economy and for investors, but it is bad news for Nouriel Roubini (at least if he wants to maximise Googel searches for his name). PS I believe that same actually goes for the Market Monetarists – we are just more interesting when things are bad than when things are great. THe interest in monetary policy simply fade dramatically when the Fed gets it more or less right and ensures a high level of nominal stability. Lund University (in Skåne, Sweden) is less than one hour drive from my home in Copenhagen so I very much hope I will be able to participate in the upcoming conference on “Free Banking systems: diversity in financial and economic growth” at Lund University School of Economics and Management on September 4 – 5 2014. Furthermore, the conference will hopefully lure monetary scholars to Copenhagen as well. I will certainly see whether we could arrange some informal get-together in Copenhagen in connection with the conference. The conference looks very promising. According to the history books one of the most scary events during the Cold War was the so-called Cuban missile crisis, where according to the history books the world was on the brink of nuclear armageddon. However, the history books might be wrong – at least if you look at what happened to the US stock market during the crisis. If we indeed were on the brink of the third world war we would certainly have expected the US stock market to drop like a stone. What really happened, however, was that S&P500 didn’t drop – it flatlined during the 13 days in October 1962 the stand-off between the US and the Soviet Union lasted. That to me is pretty remarkable given what could have happened. There might be a number of reasons why we didn’t see a stock market collapse during the stand-off. Some have argued that the crisis was an example of what has been called Mutual Assured Destruction (MAD). Both the US and Soviet Union knew that there would be no winners in a nuclear conflict and therefore neither of them had an incentive to actually start a nuclear war. It might be that investors realised this and while the global media was reporting on the risk of the outbreak of the third World War they were not panicking (contrary to popular belief stock markets are a lot less prone to panic than policy makers). Another possibility is of course that the markets knew better than the Kennedy administration about the geopolitical risks prior to the crisis. Hence, the stock market had already fallen more than 20% in the months prior to the Kennedy administration’s announcement that the Soviet Union was putting up nuclear missiles in Cuba. And the market was of course right – there was not third World War and after 13 days of tense stand-off the crisis ended. That said, the Cuban missile crisis did not go unnoticed by consumers and investors. However, we should think about such geopolitical shocks as primarily supply shocks. A geopolitical crisis increases “regime uncertainty” – in an AS/AD framework this shifts the AS curve to the left, which reduces real GDP growth and increases inflation for a give monetary policy stance. This was actually not very visible in 1962-63, but later in the 1960s it became very clear that regime uncertainty was reducing real GDP growth. In terms of stock market valuation it is important that we remember that equity prices are nominal rather than real and therefore it is not necessarily given that stock prices should drop if the central bank keeps nominal spending/aggregate demand on track. Obviously stocks could drop if the risk premium on stocks increases, but we should not necessarily expect nominal earnings growth to drop. Therefore, we need to think about the monetary policy response to a geopolitical crisis to understand how it is impacting the stock market performance. This of course is highly relevant for what is going on right now in regard to the Ukrainian-Russian conflict. The recent sharp rise in geopolitical tensions is a significant negative supply shock to both the Russian and the Ukrainian economy – visible in the sharp weakening of both countries’ currencies. However, unlike in the case of the US stock market in October 1962 the Russian and Ukrainian stock markets have sold off dramatically. Given the amount of regime uncertainty it is not surprising that investors have become a lot less happy to hold Russian and Ukrainian stocks. However, central bankers in the two countries are not making life easier for anybody either. Hence, the Russian central bank (CBR) has reacted to the sharp sell-off in the Russian ruble by intervening heavily in the currency markets and thereby tightening monetary conditions and the CBR has also increased its key policy rate by 150bp to prop up the ruble and more rate hikes might be in the pipeline. And this week the Ukrainian central bank followed the (bad) example from the CBR and hiked its key policy by 300bp. So what both of the central banks are doing now is to tighten monetary conditions in response to negative supply shock. Obvious page 1 in the central banker’s textbook tells you not to respond to supply shocks in this way. Unfortunately most central bankers never read the textbook and hence are happy to make things worse by “adding” a negative demand shock to the negative supply shock. And this of course is going to be negative for stock markets. Monetary tightening causes nominal spending to drop and hence causes a contraction in nominal earnings growth and that of course is bad news for stocks. Paradoxically we can also on the other hand imagine a situation where a geopolitical crisis can be good news for stocks (measured in local currency). Imagine that central bankers freak out about the possible negative growth consequences of a geopolitical shock and respond to this by easing monetary policy. Actual that might be what is happening in the euro zone at the moment (on a small scale). Or at least judging from comments from ECB-chief Mario Draghi the ECB thinks that the Ukrainian crisis potentially could have significant negative ramifications for European growth and it seems like the ECB has become somewhat more dovish after the Ukrainian crisis began. The Polish central bank has similarly become more dovish in its rhetoric since the outbreak of the crisis. Central banks should not react to negative (or positive) supply shocks, but if they do ease monetary policy in response to a negative supply shock then it will increase nominal GDP growth (but not necessarily real GDP growth). 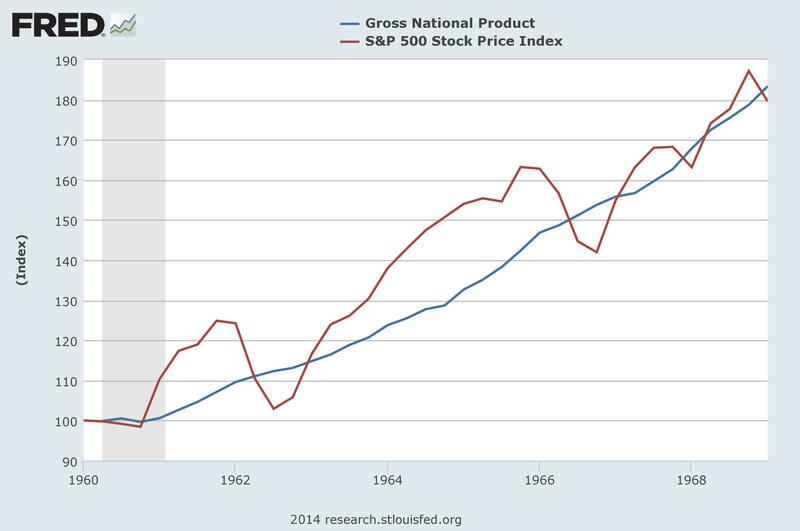 That is positive for stocks (whether or not real GDP growth increases). I am not arguing that that is what is happening now, but I am using this as an example to illustrate that we should not necessarily assume that geopolitical shocks automatically will lead to lower stock prices. It all comes down to the monetary policy response. Returning to the Cuban missile crisis it is helpful to have a look a the development in nominal GDP to understand what was going on in the US stock market during the Cuban missile crisis and in the aftermath. In 1961 US NGDP growth had been accelerating significantly – with NGDP growth going from only 0.5% y/y in Q1 1961 to 9% y/y in Q1 of 1962. That reflects a rather massive monetary expansion. However, from early 1962 a monetary contraction took place and NGDP growth started to slow significantly. This I believe was the real reason for what at the time became to be known as the Kennedy Slide in the stock market. This was prior to the Cuban missile crisis. However, as the geopolitical crisis hit the Federal Reserve moved to ease monetary policy – initially not dramatically but nonetheless the Fed moved in a more accommodative direction and NGDP growth started to accelerate towards the end of 1962 – a few months after the end of the Cuban missile crisis. I am certain this helped keep a floor under US stock prices in the later part of 1962. In fact it is notable to what extent geopolitics came to determine monetary policy during the 1960s and we might of course equally argue that geopolitical concerns to some extent were a driving force behind president Kennedy and particularly president Johnson’s expansion of the welfare state measures in the US in the 1960s. The Federal Reserve during the 1960s actively supported the expansion of government spending by trying to intervene in the US bond market to keep bond yields down for example through the (in)famous operation twist. The Fed’s policies became increasingly inflationary during the 1960s. During the early period of the 1960s the easing of monetary conditions primarily boosted real GDP growth (in line with the acceleration in NGDP growth), but as the negative impact of war spending and spending on social welfare schemes started to be felt US productivity growth started to slow significantly and as a result the continued expansion of nominal spending led to a significant increase in US inflation in the second half of the 1960s. This illustrates that higher geopolitical risks are not necessarily negative for stocks, but it might make central banks make stupid decisions. That is certainly the case of the Fed during the 1960s. Whether that is any guide for what will happen to global monetary policy today if we continue to see an escalation of geopolitical tensions is certainly not easy to say. This morning I am flying to Finland to speak about the outlook the Polish economy at a seminar in Helsinki. That is the inspiration for what I will talk about in this post – or rather I will tell the story of how an asymmetrical negative supply shock – combined with euro membership – has sent the Finnish economy into recession. It is (partly) a story of the demise of Finland’s best known company Nokia. A cornerstone in Optimal Currency Area theory is that two countries should only join in a currency union if the shocks that hit the economies tend to be symmetrical. Hence, economic shocks should tend to hit both economies at the same time and by more or less the same magnitude. A shock the oil price is a good example of a symmetrical supply shock to the euro zone countries as all the euro area countries tend to be oil importers. However, in recent years the Finnish economy has been hit by an asymmetrical supply shock – a shock which have not hit the other euro area countries. Do you remember this cell phone? Nokia used to be the Apple of the day. Today everybody have iPhones, but back in the 1990s and the early 2000s everybody had a Nokia cell phone. I still sometimes miss my old reliable Nokia cell phone – I have had a few. However, within the past 10 years things have changed. Nokia no longer command the technological superiority that it once used to have – even I who certainly is no expert on the Telecoms sector realises this. There is really nothing unusual about Nokia’s story in the since that companies come and go. However, what is unusual is just how important Nokia became in 1990s for the Finnish economy. I personally remember when Nokia 10-15 years ago was close to 90% of the overall market cap for the Finnish stock market. The Finnish economy was Nokia. However, over the past 10 years things have changed for Nokia. The company has been loosing in the technological race between the global telecoms companies. In economic terms this is a negative shock to what economists like to call Total-Factor-Productivity (TFP). I like to think of TFP as a measure of how well we are at putting together the production factors we have – labour, capital and raw materials. Obviously Nokia makes more technological advanced phones today than 15 years ago, but Nokia’s global competitors have just developed even faster. I most stress that I am generalising wildly here – after all I am not expert on the telecoms industry or on Nokia and the purpose is not to talk about Nokia as company, but the macroeconomic impact of the negative TFP shock to Nokia. Hence, a negative TFP shock for Nokia is a negative TFP shock for the entire Finnish economy. We can think of the negative TFP shock to the Finnish economy as a negative and permanent supply shock to the Finnish economy. 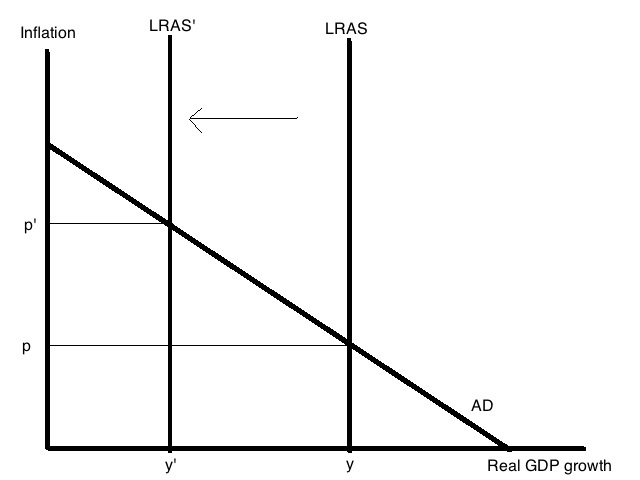 Within the AS/AD framework this shifts the long-run aggregate supply (LRAS) curve to the left as illustrated in the graph below. 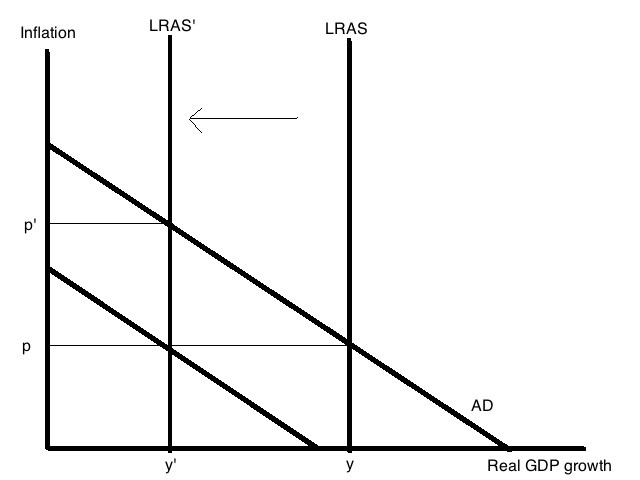 A negative LRAS shock, which shifts the LRAS curve to the left, reduces longterm real GDP growth to y’ from y and increase inflation from p to p’. Or this would be the story if we were in an nominal GDP targeting regime where the central bank essentially ensures a stable growth rate of aggregate demand – the AD curve is fixed. However, this is not the story for the Finnish economy. Finland is a member of the euro area and this have clear implications for how the negative shock to Finnish TFP has been playing out. In a situation where Finland had not been in the euro area and the central bank had been targeting NGDP a negative TFP shock would have caused the Finnish currency – in the old days the Markka – to depreciate. That would have kept aggregate demand growth “on track”, but it would still have lower real GDP growth in the longer run as the shock to TFP is assumed to be permanent. Hence, the Finnish economy would have gone through an adjustment to the lower productivity growth oath through a depreciation of the currency. This option is not possible for Finland today as a member of the euro area. To understand the transmission mechanism of the shock through the Finnish economy it is useful to think of the initial level of inflation, p, as also being the level of inflation in the euro area overall. A negative shock to Finnish productivity increases inflation to p’ – hence above euro zone inflation (p). Hence, this is essentially a negative competitiveness shock. The shock to Finland’s competitiveness has been very visible in Finland current account situation over the past decade Finland’s current account surplus has collapsed. This is a very interesting difference between Finland and other crisis hit euro zone economies. In the case of the so-called PIIGS countries we have seen a sharp improvement in the overall current account situation in countries like Ireland and Spain. 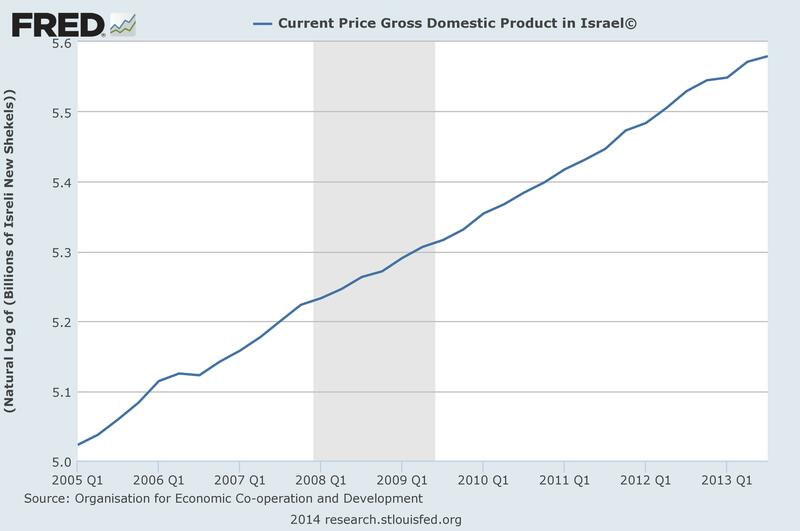 This is mostly due to a collapse in aggregate demand (NGDP) since crisis hit in 2008, but also due to improved competitiveness due to lower inflation and lower wage growth. In some ways one can say that Finland’s economic troubles are worse than that of the PIIGS in the sense that one could expect growth to pick swiftly in the PIIGS continues if just the ECB eased monetary policy (I will believe it when I see it…), while monetary easing would do nothing to improve the competitiveness of the Finnish economy. Said in another way – Mario Draghi can increase aggregate demand in Ireland or Spain, but he cannot invent the cell phone of the future. Therefore, for Finland there is indeed a “New Normal” – real GDP growth looks set to be permanently lower than it was in the 1990s and 2000s. And that will be the case no matter what monetary regime Finland has. That is not to say the monetary policy regime is not important for Finland. In fact euro membership is likely to be a drag on growth as well at the moment. To understand this we return to the AS/AD framework. Finland cannot not permanently have higher inflation (and unit labour costs) than the other euro zone members. Hence, in the AS/AD framework we need to see inflation drop back to p (the euro zone inflation) from p’. This happens “automatically” in a currency union through what David Hume termed the specie-flow mechanism. As the current account situation has worsened Finland have seen an increasing currency outflow. In a currency union or any other fixed exchange rate regime such currency outflows automatically lead to a similar decline in the money base, which lower nominal spending/aggregate demand in the economy – this is pushing the AD curve to the left. This monetary contraction will basically continue until competitiveness is re-established and inflation is back at the euro zone level (p). This is what is illustrated in the graph below. This process would be smooth if prices and wages were fully flexible. However, that is obviously not the case (in the short-run the AS curve is not vertical, but rather upward sloping) – particularly not in Finland. In fact particularly wage growth seems to have shown considerably downward rigidity in Finland in recent years. As a result unemployment has increased. While there is not much to do about the long-term productivity problem monetary policy can help ease the pain when shifting to a lower level of productivity growth. Hence, had Finland – like for example Sweden – operated a floating exchange rate regime – then the needed adjustment in competitiveness could have happened via a weakening of the currency rather than through lower wage and prices. This would not have “solved” the productivity problem, but at least the unemployment problem would have been significantly smaller – at least in the short to medium term. However, as a member of the euro zone Finland does not have that option (other than of course leaving the euro). Furthermore, while weak demand growth is a problem for the wider euro zone and hence one can argue that the ECB should do something about that (and hence help the PIIGS) it is harder to argue that the ECB should act to ease the pain from an asymmetrical shock, which have only hit Finland. When the euro was set-up it was the general assumption that asymmetrical supply shocks were rare and economically not important. However, the economic development in Finland over the past decade shows that asymmetrical supply shocks indeed can be very important economically. PS I should once again stress that this is a post about asymmetrical shocks in a currency union rather than about Nokia. Furthermore, there is a lot more to the Finnish story rather than just Nokia (for example the server problems in the paper and pulp industry).